Having acquired two Wayfarers in 2016 WHSC started a programme to help and encourage adults of all ages with no experience to get on the water and experience the thrill of sailing. It has been an overwhelming success with several going on to purchase their own boat and are now participating fully in all club sailing. This summer of 2018 we will offer a comprehensive and tailored service to all our adult members and their friends. So no excuses let’s see you give it a go and enjoy what is really a tremendous experience. 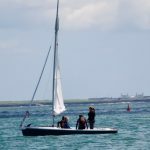 Similar to last year we will offer one hour lessons on the water in the large very safe Wayfarer dinghies of which we have two. Each boat takes two adult students plus an instructor. Allow one and half hours for each lesson between sailing and rigging and derigging. This is a super easy way to get introduced to sailing. Absolutely no experience necessary. July and August. 6.30 pm to 8.30 pm Monday, Tuesday, Thursday and Friday. In June there is more availability in the afternoons and evenings. For those that have gained the basics and some confidence we are introducing lessons in our single handed (one person) and double handed (two person) dinghies. We have club Toppers, Topaz’s, Omega’s and 420’s available or better still bring your own boat. These lessons are offered when we have at least two dinghies which will be accompanied by an instructor in a rib motoring alongside the dinghies. These lessons will be two hours on the water and the tuition more advanced than that offered to beginners. Cost is €20 per person per lesson for members and €30 for non-members. July and August. 6.30pm to 9pm. Monday, Tuesday, Thursday, and Friday. 3pm to 6pm Wednesdays. 10am to 1pm Saturdays. We can offer full ISA accreditation for all lessons to members only. This means your instructor will have a plan for each lesson and will sign off the sailors on reaching competency in specific skills, so that sailors are building modules to achieve official ISA accreditation similar to the kids. This can be done over any time period at the sailors own pace and can in fact be carried to and recognised in other clubs or sailing schools. A WhatsApp group will be set up so all adults wishing to take lessons must register to get communication. To join text Adult Training and your name to Roy Power on 086 2566960, and you will be joined to the group. Availability for the week ahead will be sent out on WhatsApp regularly. Bookings can only be made through WhatsApp to Roy Power who will coordinate. Bookings can be cancelled without charge up to two days before the booking however a full charge will be made for cancellations within two days. Sailors can be substituted at their own discretion. Where lessons have been abandoned due to weather the lesson will be rescheduled as soon as practical. We will endeavour to secure coaching for a minimum of four boats at any level at any time with reasonable notice. 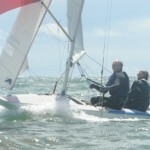 All four or more boats need to be of a similar skill level with a common coaching goal. Contact Roy Power to organise. With favourable weather, plenty of notice and sufficient money we will endeavour to accommodate any training request from private lessons to coaching for any particular skill, so if your needs are not met by our official programme please feel free to contact us to explore possibilities. ALL SAILING IS SUBJECT TO WEATHER AND AS SAFETY IS OUR PRIMARY GOAL, THE SENIOR INSTRUCTOR, SAFETY OFFICER OR COMMODORE HAS THE FINAL CALL ON SAILING ON ANY PARTICULAR DAY. DINGHY HIRE IS ON A FIRST COME FIRST SERVED BASIS.